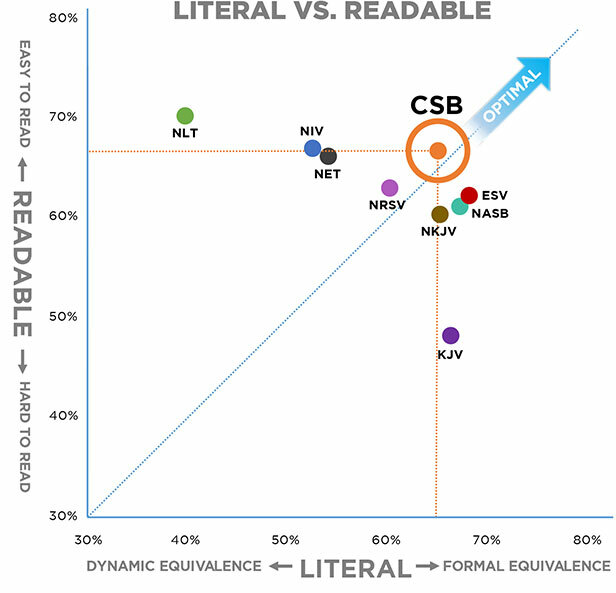 The Christian Standard Bible is said to be a Bible that is committed to “optimal equivalence.” Optimal equivalence is “a translation philosophy that pursues both linguistic precision to the original languages and readability in contemporary English” according to the CSB oversight committee. What distinguishes the translation of the CSB from other translations is its readability, according to Dr. Schreiner. The oversight committee have taken the liberty to develop readability by employing certain terms that offer an optimal English equivalent. Interestingly, though, five other major translations have all translated the Greek term “λοίδορος” into either the term “reviler” or “abusive” (cf. ESV, NIV, NLT, NASB, and RSV translations). Yet, for the first time the CSB has added further translational touches with the adjective “verbally” to modify “abusive” in the translation “λοίδορος.” This is something that no other popular English translation has done to date. The CSB translated this word, and others like it, in an effort to develop readability of the original text saying, “Research shows the CSB is both highly literal to the original languages and highly readable, achieving an optimal balance of the two.” From the perspective of the oversight committee, “verbally abusive” better captures the modern English equivalent of the original Greek term. One consideration of the new work by the CSB is that the oversight committee used a word that is psychologically charged, and even more ambiguous that the term reviler. Verbal abuse is a term that is extraordinarily difficult to pin down, a term that means everything from threats of violence to one person being critical of another person. In seeking to offer “readability” the translators have stepped away from objectivity. They have made a highly psychologized step into modern psychological terms when translating the original text of Scripture. In using the term “verbally abusive” pandora’s box has just been opened. Of greater significance is that the translators introduction of the psychological term “verbally abusive” has just solidified the use of psychological terms, and associated them with the original biblical texts. Now, psychological ideology will also be read into the original texts of Scripture by those who have honest and good desires to understand the Word of God. What will be next is the employment of other psychological terms and disorders, where the modern reader of Scripture will interpret back into the biblical text psychological ideology. Even though a term may be used more in modern English, that does not make the term accurate to represent the concept. Perhaps the term “verbally abusive” is a term that is used in modern English more than the term “reviler”? In all fairness to the oversight committee, it is entirely possible that the modern English speaker does not regularly use the term “reviler.” But in an effort to provide readability, the committee has just acquiesced to the psychological assumptions that come with the term “verbally abusive.” Furthermore, there is no greater clarity brought to the text; what do we mean by “verbally abusive”? Yes, we don’t use the term “reviler” but who regularly uses the term “propitiation” or perhaps “atonement”? At what point do we call the reader of Scripture to develop their vocabulary so they can better understand biblical concepts? So-called readability has just segued into affirmation of psychological ideology in the CSB. Finally, the trend of the CSB is significant to consider. Now, the modern reader will have to do their own heavy lifting to separate psychological ideas from the text of Scripture, which they should admittedly already be doing. For most readers of Scripture, however, they are not going to do that heaving lifting and will accept the modern psychological term and its associated meaning. As if it weren’t difficult already to resist psychological ideology, now the translations of Scripture are absorbing them. This means that most will come to the text and read in their modern understanding of “verbally abusive.” They aren’t going to pause and reflect over what the term means in the original languages, but will accept the modern psychological connotations that come with that term. And there will be more instances like this in the future. I’m in no way suggesting Dr. Schreiner or others on the oversight committee are lacking in theological orthodoxy or biblical commitments. Frankly, these are some of the most brilliant minds in modern evangelicalism. What I am suggesting, though, is that the oversight committee has just affirmed the use of certain psychological terms and married them to biblical texts. By inserting a psychological term to represent a biblical idea, they have opened pandora’s box for reading back into biblical texts psychological ideology. This is the beginning of the incorporation of psychological terminology in Bible translation. By Greg E. Gifford in Uncategorized on June 23, 2018 .